When I thought about the concept of "that's a steal," I was inspired to look at the notion broadly...not just the wine, but the food as well. 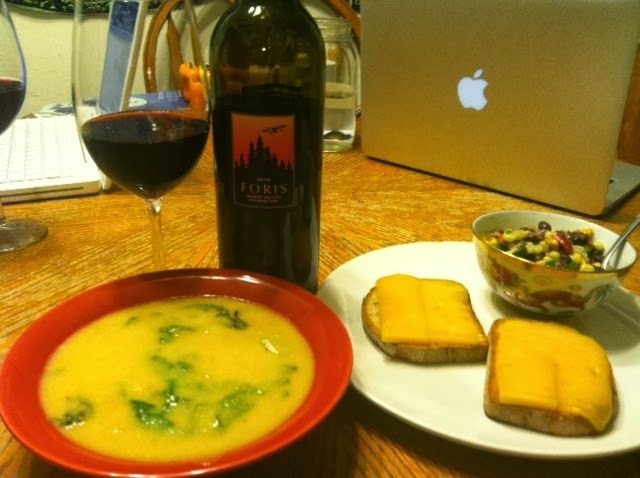 I'd picked up a bottle of Fly Over Red, a Rogue Valley blend for Foris Winery, and I wanted to create around it a meal that was also delicious and inexpensive. Red blends are rather like my wine comfort food, and so I decided that I'd test out this one along with my ultimate food of comfort - grilled cheese and soup. Place all ingredients in a crock pot and put on low overnight. In the morning blend well with a hand blender until smooth. Add milk and let rewarm. Makes about 1 gallon of soup. I know the proportions are HUGE - I made enough to freeze. Cut kernels off of corn. Wash and drain beans. Chop pepper and onion finely. Toss all vegetables with the cilantro and cumin. Whisk oil and lime juice together to form an emulsion and pour over salad. Salt and pepper to taste. Makes 2-4 servings depending on how much you like salad! Grilled cheese - go here: http://www.youtube.com/watch?v=vq7G-Q9ZwC0 to see Hannah Harto's awesome episode of "My Drunk Kitchen." Seems apropos. That soup looks amazing...as I know the wine is!